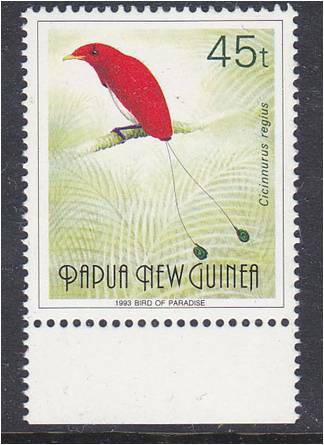 The Papua New Guinea 45 toea Bird of Paradise stamp of 1991/1994 was reprinted several times; each time a subtle change was made. Also there are several other reprints of this issue, using the Kapul that’s the little figure in the left margin to identify the reprints, to my knowledge there have been two of this type of reprint. I only have the second. To add to the confusion there are also emergency overprints and the large T issue which was released in error. 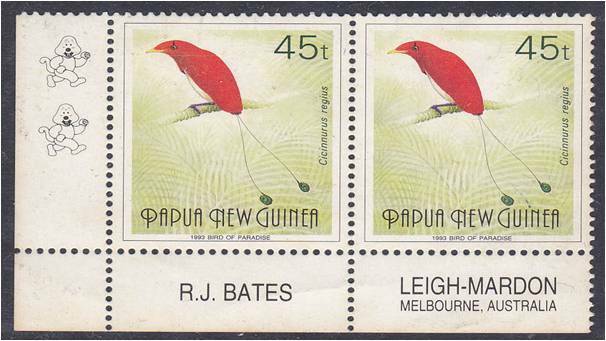 Speculators were paying thousands for the set of four large T stamps, one of which is the 45 toea and the others being 21T, 60T, and the 90T. To put a stop to the speculators, the PNG post office printed and officially released the large T set to the public at face value. Thus speculators lost thousands of dollars. I’ll turn now to the emergency overprints. 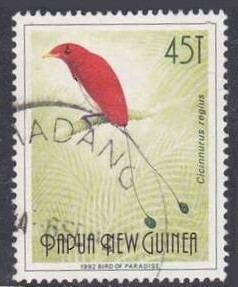 The 45 toea is one of two values in the first THIN overprint type, the other being the 90 toea. Again the devil is in the details; also the 1992 is a large T overprinted. Now we come to the thick overprints, this information is from a dealer’s price list. 21t on 45t with small t and 1993 at the base. 21t on 45 with large T and 1992 at the base. 21t on 45t small t with 1992 at the base. I do not have any of the 21t on 45t thick overprints but pictured here is the 21t on 90t so you can see the difference. 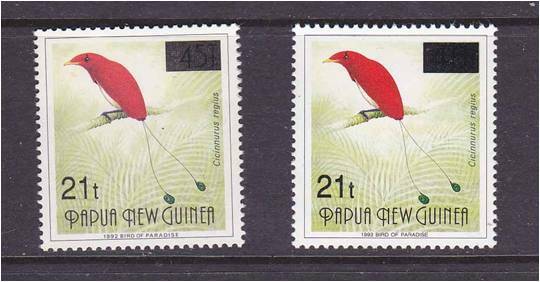 The value of these stamps varies considerably based on the dates in the bottom margin - from a few dollars to several hundred. So it pays to be vigilant.